Well, good luck trying to predict next year’s return—or even just tomorrow’s. But surprisingly, there are several recognized methods for projecting the S&P 500’s SPX, +0.72% return in the next 7 to 15 years, and they’re pretty good. Jones is the first to say that these formulas, including his own, aren’t guarantees and can’t be used to time the market. After all, the S&P 500 could go up for the next five years at a 1% real rate, before dropping 9% a year for the next five years. The initial rally, followed by a fear cycle, would suffice to reduce your account to $1,776. That’s not a prediction—nothing about the market happens in a straight line—but remember that the S&P 500 has crashed much harder than a 34% loss TWICE in the past two decades. During the 2007–2009 bear market, the S&P 500 lost 56%, adjusted for dividends and inflation. In the same period, Vanguard’s long-term Treasury fund VUSTX, +0.60% gained 18%, and iShares’ gold IAUF, -0.24% actually rose 22%. No mater how bad the stock market may get, something else is always going up. 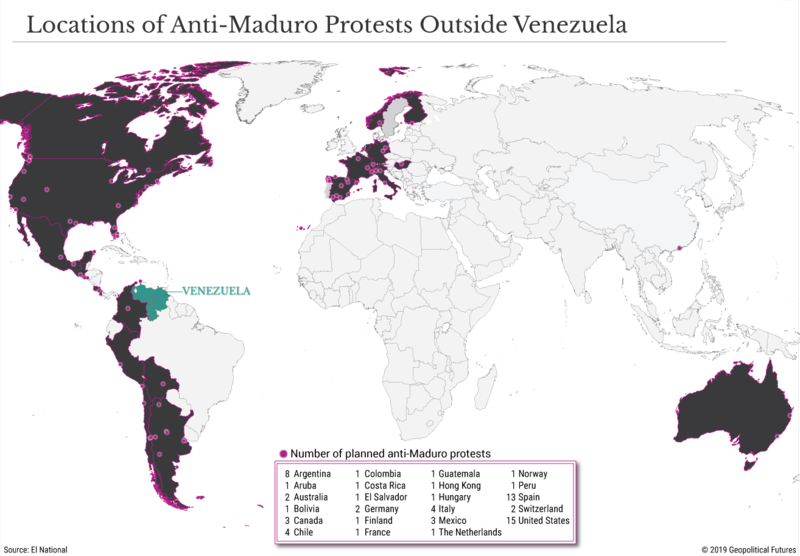 IF PROTESTS ALONE could oust a president, Nicolás Maduro would already be on a plane to Cuba. On January 23rd at least 1m Venezuelans from across the country took to the streets demanding Mr Maduro step down. They were answering the call of Juan Guaidó, who last week proclaimed himself the rightful head of state. Mr Guaidó has won the backing of most of Latin America, as well as the United States and Europe. Protests planned for February 2nd promise to be even bigger. But Mr Maduro is supported by the army as well as Russia, China and Turkey. As The Economist went to press, he was still holding on to power. Much is at stake. Most important is the fate of 32m Venezuelans made wretched by six years under Mr Maduro. Polls suggest that 80% of them are sick of him. Other countries are also hurt by Venezuela’s failure. The region is struggling with the exodus of over 3m of its people fleeing hunger, repression and the socialist dystopia created by the late Hugo Chávez. Europe and the United States suffer from Venezuela’s pervasive corruption, which enhances its role as a conduit for narcotics. And as world leaders pile in for Mr Maduro or against him, they are battling over an important idea which has lately fallen out of favour: that when a leader pillages his state, oppresses his people and subverts the rule of law, it is everybody’s business. The scale of the disaster Mr Maduro has brought down upon Venezuela is hard to comprehend. In the past five years GDP has fallen by half. Annual inflation is reckoned to be 1.7m per cent (the government no longer publishes the numbers), which means that bolívar savings worth $10,000 at the start of the year dwindle to 59 cents by the end. Venezuela has vast reserves of oil and gas, but the state oil company has been plundered and put under one of the country’s 2,000 generals, who has watched production tumble to 1.1m barrels a day. People are malnourished and lack simple medicines, including antibiotics. Hospitals have become death traps for want of power and equipment. Blaming his troubles on foreign conspiracies, Mr Maduro has rejected most offers of humanitarian aid. Despite this litany of suffering many outsiders, especially on the left, argue that the world should leave Venezuelans to sort out their differences. Some adopt Mr Maduro’s view that Mr Guaidó’s claim to the presidency, recognised immediately by the United States, is really a coup. Russia, which has worked hard to discredit the idea that Western intervention can ever be benign or constructive, is reported to have sent 400 troops from a private military contractor, also spotted in Syria, Ukraine and parts of Africa, to protect either the regime or Russian assets. Abandoning Venezuela to the malevolent rule of Mr Maduro would be wrong. If anyone has launched a coup it is he. He was inaugurated on January 10th for a second term having stolen last year’s election. In his first term, won in 2013 in another dubious vote, he eroded democracy by silencing critical media and eviscerating the constitution. He packed the electoral commission and the supreme court with puppets and neutered the national assembly, which the opposition controls. By contrast, Mr Guaidó has a good claim to legitimacy. As head of the national assembly, he serves as acting president if the office is vacant—which, because Mr Maduro is not a legitimate occupant, it is. 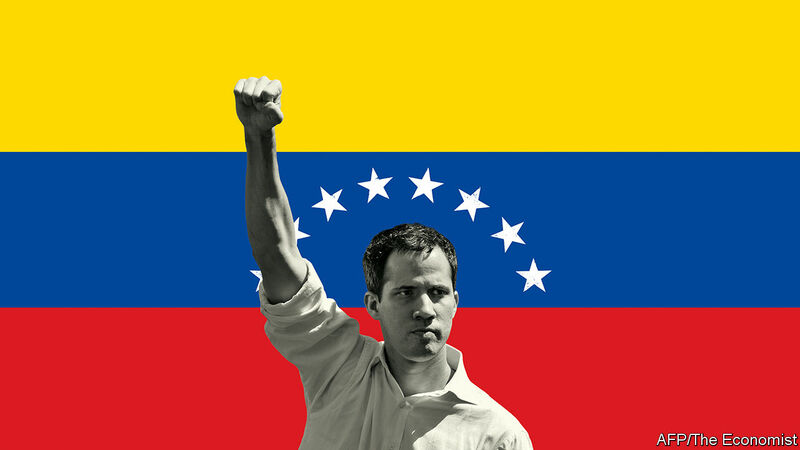 The question is not whether the world should help Mr Guaidó, but how. This week the United States, still Venezuela’s main trading partner, imposed what amounts to sanctions on oil exports and on imports of the diluents needed to market its heavy oil. By ordering that payments for Venezuelan oil must be put in bank accounts reserved for Mr Guaidó’s government, the United States aims to asphyxiate the regime, in the hope that the armed forces will switch to Mr Guaidó. One danger is that Mr Maduro digs in and orders the security forces and the colectivos, organised thugs at the regime’s service, to impose terror. Another is that the United States overplays its hand. Just now it is working with the Lima group of regional governments. But its sanctions could hurt the people more than the regime. If, bent on regime change, it acts unthinkingly, it could come to be seen once again in Latin America as imperialist and overbearing. Russia is portraying the United States’s intervention as an attempt to dominate its backyard. Its media are already saying that Vladimir Putin’s interest in Ukraine is no different. The situation is a test of President Donald Trump and his foreign-policy team, including the hawkish national security adviser, John Bolton. This week Mr Bolton hinted at the use of American troops. Barring state violence against American citizens, that would be a mistake. Mr Guaidó’s backers have ways to help without resorting to force or dirty tricks. These fall into two categories. The first includes incentives for Venezuelans to demand change, for the army to abandon the regime and for Mr Maduro to go. Now that Mr Guaidó has been recognised as interim president, he stands to control billions of dollars of Venezuela’s foreign assets if power shifts. The national assembly has passed a law offering an amnesty to soldiers and civilians who work to re-institute democracy. Mr Maduro is being promised the chance to flee the country. The second way to help is to let Venezuelans know that the world is ready if Mr Guaidó takes power. The lesson from the Arab spring is that even a leader who starts by sweeping away a tyrant must bring improvements rapidly or risk losing support. The immediate priorities will be food and health care. The very fact of a new government will help stop hyperinflation, but Venezuela will also need real money from abroad—international lenders, including the IMF, should be generous. The to-do list is long: Venezuela will need to remove price controls and other distortions and build a social safety-net. It must restart the oil industry, which will entail welcoming foreign investment. Its debt will need restructuring—including the debt to Russia and China which is due to be paid in oil. And amid all this, Mr Guaidó’s caretaker government must hold elections. A generation ago, Venezuela was a functioning state. It can be again. It is blessed with oil and fertile land. It has an educated population at home and in the diaspora that fled. And in Mr Guaidó it has a leader who, at last, seems to be able to unite the fractious opposition. But first it must get rid of Mr Maduro. On dealership forecourts across the world, rival car brands vie for consumers’ attention and business. But often behind the scenes, those competitors are working together, helping each other out by supplying engines or sharing technical knowhow. The little-seen world of car collaborations received its newest member last week, when Ford and VW announced a sweeping alliance that will begin making commercial vehicles for each other, but may extend to co-developing electric cars, self-driving systems and other future vehicles. Collaborations between otherwise-fierce rivals are not new in the industry. General Motors and Ford used to develop vehicle transmission parts together, while BMW and Mercedes-Benz-owner Daimler buy parts together. But to prosper from the coming wave of expensive technologies, from battery cars to autonomy, manufacturers will need to seek financial strength in numbers. “We have to reduce the amount of money everybody’s pouring in, because in the end consumers basically wants cheap transportation,” said Don Walker, chief executive of parts supplier Magna, in a speech at the Detroit Auto Show. But partnerships are often fraught with tension. The alliance between Renault and Nissan is a case in point as the nearly two decade partnership has experienced rising tensions between the two companies, not helped by the dramatic arrest and incarceration in Tokyo of Carlos Ghosn, its chairman and chief executive. When the two groups started to develop their first electric models, they wanted to collaborate as much as possible. But neither side’s engineering team wanted to cede ground, and the resulting cars had a small number of common parts. Ford and VW were at pains to stress the health of their embryonic partnership. “We trust each other,” said Jim Farley, Ford’s president of global markets. The only concrete plans are for Ford to make a commercial van and a pick-up truck for VW, and for VW to make a city van for Ford. But in future talks, it seems there are no limits for possible future projects. In an interview with the Financial Times, VW chief executive Herbert Diess ruled nothing out, from Ford gaining access to the vast pool of electric car materials that VW plans to purchase, to possible future work on jointly developing vehicles. There have even been some “smaller discussions around the edges” on future vehicles but “nothing concrete”. “It always has to be a case of give and take,” he said. The problem is that, sooner or later, one side will run out of things to “give”. This goes to the problem at the heart of alliances. When two or more companies are in a give-and-take relationship, sooner or later one business emerges as the stronger partner, leading to resentment among the weaker partner. “The idea that both sides win never lasts for long,” said one former member of the Renault-Nissan Alliance, a partnership that looks close to breaking point, as it is about to celebrate its 20th birthday this year, after the arrest of its leader Mr Ghosn. The question with Ford and VW is whether VW will run out of things it wants from Ford before Ford runs out of things it wants from VW. Analyst John Murphy at Bank of America Merrill Lynch said he thinks that “what’s good for VW may not be so good for Ford”, adding the US carmaker risks “giving access to the crown jewel” by offering to make pick-up trucks for VW. Significantly, the two companies both ruled out a full merger, or any changes in capital structure, possibly eyeing mistakes made in the past with memories of the disastrous tie-up between Daimler and Chrysler still fresh. Once committed to a partnership, it can also be difficult to unravel. For example, Renault and Nissan, which own stakes in each other, will face an extremely difficult and costly task in unwinding their capital structure should they choose to break ties. The idea of carmakers pooling resources for survival was reinvigorated in 2015 by Fiat Chrysler’s late former chief executive Sergio Marchionne, whose own merger of Fiat and Chrysler in 2009 was one of the industry’s rare success stories. His presentation “Confessions of a Capital Junkie” became an industry shorthand for the rationale behind collaborations, arguing that carmakers should not all invest separately into technology that will become commoditised, such as electric vehicle systems. His claims were also fuelled by FCA’s desire to find a partner or buyer for the debt-riddled company — a desire that proved unnecessary, with the business hitting its lofty financial targets last year. Today, FCA falls into the bracket of mid-size carmakers that would still benefit from working with others. The group is developing self-driving systems with BMW, and commercial vehicles with PSA. “I am open to all of these opportunities,” FCA chief executive Mike Manley told the Financial Times. “They are not crucial to my survival — but they may be beneficial to it. Another leading carmaker, General Motors of the US is working with Honda on several projects, from fuel cell development to autonomous vehicles, but like others, the groups have been reluctant to commit too closely. They have stopped short of calling the relationship an “alliance”. The reason isn’t, as the Trump administration would like to believe, the U.S.’s trade offensive. 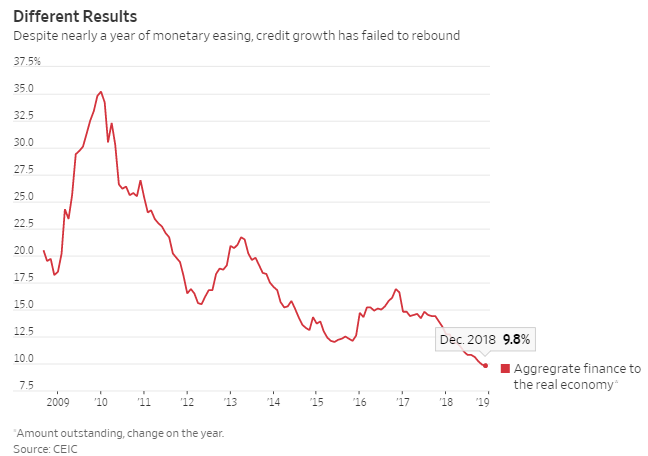 Instead, Beijing has overdone its own crackdown on nonbank “shadow finance”—without opening alternative channels for private-sector borrowers, who often struggle to obtain bank credit. As a result, Chinese credit growth has continued to decelerate, despite nine months of significant central bank easing. If it doesn’t turn back up soon, producer-price inflation could turn negative—causing big problems in the heavily indebted industrial sector. The mushrooming of Chinese shadow banking was an unfortunate, but necessary, byproduct of a banking system that has grown more state dominated since 2010. Private companies account for about two-thirds of the economy but receive only about a third of net new lending. It’s little wonder they have turned increasingly to unofficial channels to get loans. Last year’s shadow banking crackdown has therefore created a lending bottleneck. 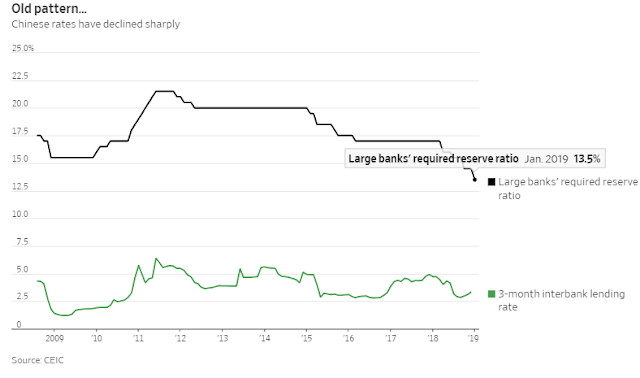 Even though banking-system liquidity is ample, state-owned banks still aren’t directing money to credit-hungry corporate borrowers, leaving it sloshing around the financial system instead. Turnover in China’s interbank lending market was 21% higher in the fourth quarter than a year earlier. 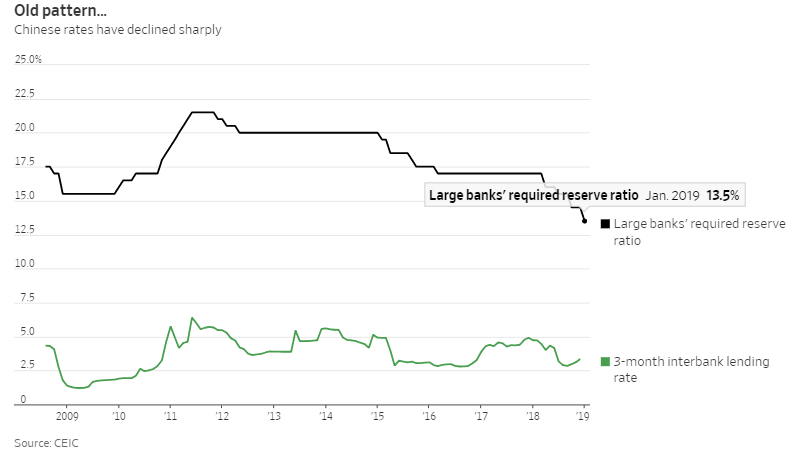 In past easing cycles, China’s central bank typically cut benchmark interest rates or reduced the amount of cash banks must hold in reserve, stoking a pickup in borrowing by companies and households a few months later. Not this time. Despite several big reserve ratio cuts and sharply lower benchmark interbank rates, growth in net nonfinancial fundraising had declined to 9.8% in December, its lowest in more than a decade. The Venezuelan government is no stranger to protests, but the latest wave promises to be different. A new wave of protests is ripping through Venezuela. Members of the country’s population, having lived for years with hyperinflation, food shortages, violence and oppression, are taking to the streets today to try to oust President Nicolas Maduro. It’s a familiar scene – similar demonstrations have rocked Venezuela many times before. But compared with previous episodes of unrest, including mass protests in the spring of 2017 that seemed to portend a change, the current demonstrations are more organized and more sophisticated. In and beyond Venezuela, politicians, risk analysts, think tanks and ordinary citizens alike believe that the country’s opposition has a unique but fleeting opportunity to overthrow the Maduro government once and for all. One factor setting the current protests apart from previous ones is the opposition’s level of cohesion. A lack of unity and organization has dogged the opposition in the past and kept it from effectively mobilizing against Maduro. This time around, though, the opposition has been planning for months and has strategically timed its protests. Demonstrating after Maduro’s inauguration for a second term and the National Assembly’s swearing-in earlier this month will give the opposition a chance to make a fresh start with a new leader, Juan Guaido, who became president of the parliament Jan. 5. In addition, the date the opposition chose for the protests – Jan. 23 – is the 61st anniversary of a civilian-military coup that ousted Marcos Perez Jimenez. A week before the protests, opposition members of the National Assembly held town hall meetings in their jurisdictions to mobilize the local populations. (At least 328 municipalities held such meetings in the Caracas area alone.) During the events, they explained the protests’ goal – to effect a political transition in the country that would lead to free and open elections – and instructed the public on how to join. Universities across Venezuela also have banded together to encourage participation in the marches, and 22 different countries have planned to hold solidarity marches Jan. 23. All in all, the opposition has made a much more concerted effort to prepare for the current protests than it has for past events, including the 2017 demonstrations, which relied on social media to generate crowds that then lacked direction. As part of its planning, the opposition has reached out to the Venezuelan military. The opposition Democratic Unity Roundtable, or MUD, has been calling on the security forces to join in its protests for weeks – a contrast to 2017, when it made an attempt to draw junior servicemen to the movement through a haphazard barrage of tweets. And this time, the MUD has made a personal as well as a political appeal, recognizing that members of the armed forces are suffering the same economic hardships that are afflicting civilian protesters. Guaido promised active military members amnesty under a new government in exchange for their support and framed the protests as an opportunity to unite with the rest of the country, rather than to divide the security forces. His wife joined the cause, too, seeking support from military spouses and families in a video. At the same time, retired members of the security apparatus have issued statements reminding the military that its job is to defend Venezuela, not necessarily its leaders. Compared with its previous attempts at an uprising, the opposition’s latest protest movement has taken a more sympathetic and inclusive view of the military, and it seems to be paying off: Dozens of members of the national guard were arrested Jan. 21 after attempting a mutiny. The discontent in the military only added to organized campaigns that played out in the media to support the opposition. Since Maduro’s inauguration day, U.S. outlets such as The Washington Post and the Miami Herald have been publishing accounts from Venezuelan sources of cracks in the government. Stories of Venezuelan military officials fleeing the country and disavowing Maduro followed, along with an op-ed by Miami Herald columnist Andres Oppenheimer calling for change in Venezuela. In South America, meanwhile, a Colombian TV news channel broadcast footage of Venezuelan soldiers in Peru and Colombia denouncing Maduro and declaring their support for the protests. Social media, too, has given the international community a venue to boost the Venezuelan opposition. U.S. Sen. Marco Rubio has taken to Twitter to criticize the Maduro government, expressing support for the protests and for the arrested mutineers. President Donald Trump’s national security adviser, John Bolton, has also used Twitter to condemn the Venezuelan government. It’s part of an active campaign to bring attention to the protests – which differentiates them from those that occurred in 2017. Furthermore, the U.S. support goes beyond tweets and news stories – a change for the Venezuelan opposition. The United States has long disapproved of Maduro, but until recently, it didn’t launch a concerted campaign for regime change, beyond making statements condemning the government and issuing sanctions against it. Today, by contrast, it’s clear that the U.S. is fully behind the Venezuelan opposition and ready to support a transitional government. Washington has redoubled its efforts to break the Maduro administration, intensifying its sanctions, repeatedly affirming its recognition of the National Assembly as Venezuela’s legitimate governing body, and coordinating its stance with Brazil and Colombia. In fact, U.S. Vice President Mike Pence, Colombian Vice President Marta Lucia Ramirez and former Colombian President Andres Pastrana Arango recently met with two leaders of the Venezuelan opposition. Under mounting pressure, the Maduro government has responded as best it can. It suppressed the alleged mutiny in the national guard, for example, and the military has consistently rejected reports of dissent or chain of command problems. Community groups allied with the government, known as colectivos, have increased their presence on the streets, while Maduro’s supporters have called their own town hall meetings to counter those of the opposition. Still, the government’s opponents far outnumber its defenders. As the opposition puts its months of planning and organization to the test in today’s protests, the Maduro administration will be on the defensive, relying on security operations to maintain order and cling to power.